The 39-state German Confederation (1815–1866) still included several microscopic states. Kleinstaaterei (German: [ˌklaɪnʃtaːtəˈʁaɪ], "small-state-ery") is a German word used, often pejoratively, to denote the territorial fragmentation in Germany and neighboring regions during the Holy Roman Empire (especially after the end of the Thirty Years' War) and during the German Confederation in the first half of the 19th century. It refers to the large number of virtually sovereign small and medium-sized secular and ecclesiastical principalities and Free Imperial cities, some of which were little larger than a single town or the grounds of the monastery of an Imperial abbey. Estimates of the total number of German states at any given time during the 18th century vary, ranging from 294 to 348 or more. Furthermore, many German states were composed of two or more non-contiguous parts, often politically united through a marriage. Most states had at least one or two enclaves or exclaves, and some considerably more. In the summer of 1789, young Wilhelm von Humboldt and some friends, leaving Brunswick, capital of the Principality of Brunswick-Wolfenbüttel, for France to observe the revolutionary events unfolding in Paris, needed to enter and exit six duchies, four bishoprics and one Free Imperial City (Aachen) before reaching the French border. The political fragmentation of the Empire was the single most salient characteristic of German history throughout the early modern period; it underlay and conditioned development in all areas of public life. Whereas in other parts of Europe such as France, coherent nation states emerged from the early modern trend of political concentration and centralisation, no such state emerged within the Holy Roman Empire. While two relatively large states developed within the Holy Roman Empire, both—the Habsburg Monarchy and the Kingdom of Prussia—were really multinational empires that included substantial non-German territories and lands outside the borders of the Holy Roman Empire, while excluding major parts of Germany proper. 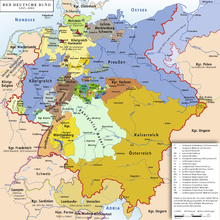 Apart from these two states, the Holy Roman Empire consisted of hundreds of small, German-speaking principalities, most of which derived from successive dynastic splits (feudal fragmentation), sometimes reflected in compound names such as Saxe-Coburg; some of these were united through royal marriages, although the resulting entity was often not a contiguous territory. During the early modern period, these small states modernised their military, judicial, and economic administrations. These hardly existed at the imperial level, and the emperor was little more than a feudalistic confederal figurehead, without political or military clout. After the Reformation, the Empire's small states were divided along religious lines. Those headed by Roman Catholic dynasties faced those ruled by Protestant dynasties in the Thirty Years' War and other conflicts. After French Emperor Napoleon Bonaparte forced the Holy Roman Emperor, Francis II, to dissolve the Empire in 1806, Kleinstaaterei was altered, but not eliminated. Through the elimination of territories ruled by prince-bishops (secularisation) and through the consolidation of neighbouring principalities, enclaves and exclaves, Napoleon reduced several hundred states into a relative concentration of a little over two dozen states in the Confederation of the Rhine. This confederation did not survive Napoleon's military defeat at the hands of the allies, but the previous principalities were not entirely restored. Prussia and the Austrian Empire—the successor state to the Habsburg Monarchy—were the only major German powers, and neither had been part of the Confederation of the Rhine. The victorious allies, including Prussia and Austria, decided at the Congress of Vienna (1814–15) on widespread dynastic restorations, although some of Napoleon's consolidations were maintained, and Austria and Prussia helped themselves to some formerly independent territories. The resulting territorial division resulted in a consolidated version—around 40 states—of the pre-Napoleonic Kleinstaaterei. The rise of nationalism across Europe brought movements striving for "nation-states", each governing an entire (ethno-cultural) people. German nationalists began to insist on a unified Germany. The call for a unified nation-state was one of the central demands of the Revolutions of 1848, but the ruling dynasties of the smaller German states and of multinational Austria and Prussia managed to resist nationalist efforts at unification. Also German writer and statesman Goethe had always opposed this, writing: "Frankfurt, Bremen, Hamburg, Luebeck are large and brilliant, and their impact on the prosperity of Germany is incalculable. Yet, would they remain what they are if they were to lose their independence and be incorporated as provincial cities into one great German Empire? I have reason to doubt this." Only after Prussian Chancellor Otto von Bismarck gradually built a unified German state under the Prussian royal house of Hohenzollern did Kleinstaaterei largely end in 1871 with the founding of the German Empire. (The only surviving petty states—Luxembourg and Liechtenstein—lie at the periphery of the German-speaking world.) The founding of the German Empire created a largely German nation-state. While the German Empire excluded the partly German but multinational Habsburg domains of Austria–Hungary, it included a substantial Polish minority in parts of eastern Prussia and other minorities along its northern and western borders. The unification of the German Empire put Germany on the map as a major European power, albeit too late to become a major colonial presence. 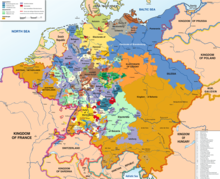 Internally in the nation some of these fragmented boundaries and small political units continued to exist until the modern States of Germany were established in the Federal Republic after World War II. The ancient Prince-Bishopric of Liège, with its tormented geography, was the French-speaking counterpart of German Kleinstaaterei. Liège was part of the Holy Roman Empire for 800 years. The decentralised nature of Kleinstaaterei made it difficult for the German economy to live up to its potential. Varying systems of weights and measures, different currencies and numerous tariffs impeded trade and investment, although the creation of the German Customs Union had begun to lift these barriers. The startling rapidity of Germany's economic growth after unification under Bismarck provided further evidence that the Kleinstaaterei had been economically repressive. The system did contribute to cultural diversity within Germany, and the numerous rival courts—though usually politically insignificant—often gained some renown through patronage. Today, the term Kleinstaaterei is sometimes used in the German media and elsewhere in a figurative sense to describe the German political system of federalism in a critical way, especially referring to its seeming inefficiency to decide on reforms in political fields that are the responsibility of the Länder and thus are under the auspices of sixteen different administrations. As of 2010, Kleinstaaterei is most often invoked in matters of educational policy, such as the difficulties caused by the different school systems for children of families that move from one Land to another. ^ Historian J. Whaley defines Kleinstaaterei as "A (pejorative) term coined in the early 19th century to denote the extreme territorial fragmentation of the Reich". J. Whaley, Germany and the Holy Roman Empire (1493–1806), Oxford University Press, 2011, vol. 2, p. 653 (Glossary). ^ E. D. Brose, German History 1789–1871, From the Holy Roman Empire to the Bismarckian Reich, Berghahn Books, 1997, p. 4. ^ John Gagliardo, Germany Under the Old Regime, 1600-1790, Longman, 1991, p. viii.